The UK five pound coin celebrating the Millennium and Greenwich Mean Time. Egypt, 1973, 5 piastres. 75th anniversary of the National Bank. Jamaica, dollar, 1981. World Food Day. 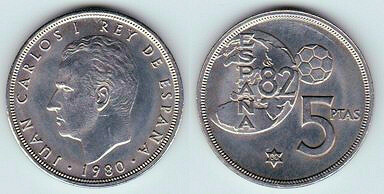 See also: Coins commemorating the Caribbean Development Bank. On the few coins with something looking like an actual globe (Jamaica is a real laugh), you get the well-known effect that the side facing the viewer will show the country where the globe was made. I guess the big yellow thing in the sky is either the Isle of Man, sliding on a monorails, or a waffle iron. Are you sure the foggy disc on the UK coin is meant to be a globe and not e.g. a clock face? It's meant to be both, since it also celebrates Greenwich Mean Time: symbolically, for the world's time, London represents the centre of the world. The Expo, 2005, Aichi, Japan. 500 yen. South Africa 1995 UN commemorative. 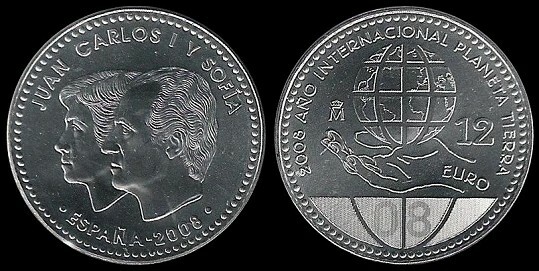 Cuba, 1980, 1 peso. Soviet-Cuban space flight. 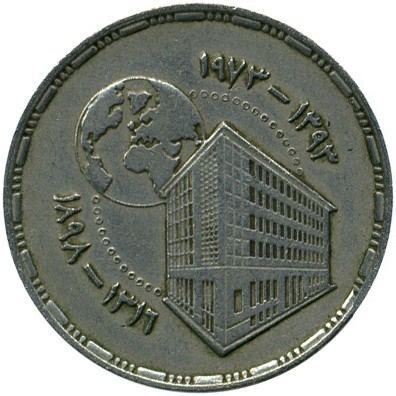 Egypt, 5 piastres, 1968. International Industrial Fair.